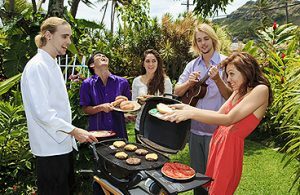 Although cold weather certainly discourages outdoor barbecue parties and gatherings, there is only one way to assure you are ready to organize one when it warms up — by performing a nice cleaning service on your barbecue. Nothing can quite spoil the fun of a party like having a dirty barbecue. Getting the item really greasy and spoiled and not spending some time to clean it will not only ruin your cooking efforts, but also holds other potential safety risks. After multiple uses and some time spent in storage, your barbecue might not be the best shape for cooking. It is definitely going to be in need of cleaning service. The following tips aim to provide you with information on how to effectively perform that. It is always a good idea to familiarize yourself with the manufacturer’s instructions on how to clean the barbecue item. Since every such tool is different, so are the methods and techniques suggested for cleaning. For the sake of your own safety and the safety of the barbecue, follow all tips and suggestions in the instruction manual. In case you are new to cleaning your barbecue, one of the most important things to keep in mind is to clean it while it is still warm. Otherwise you will find that spoils are in a hard state that makes it too difficult to clean them. Of course, this doesn’t mean troubling yourself with the barbecue during the party. Instead, you can clean the big pieces of residue and place a bowl of water on one of the burners. Heat it up to boil it and then close the lid. The resulting steam cleaning will be enough to keep the grill spoils soft and ready when you get to it later. Use the item to get certain parts and components of your barbecue in the dishwasher. All you have to do is check to see if the parts can fit in there. Also, make sure you scrape off some of the accumulated spoils, or else you risk clogging the drain. The grease tray presents one of the biggest cleaning challenges, since this is the item that collects most spoils. There is a certain technique you can use, which features lining the tray with aluminum foil and grease absorbent mix or kitty litter. Lift the foil once the item has saturated enough grease. Getting the interior of your barbecue clean and shiny is somewhat tricky. Disassemble most parts, with the exception of gas conveyors (assuming it’s a gas barbecue) and give all of them a good cleaning service. Be careful around painted surfaces, as you don’t want to damage the coat. Burners should receive more attention. If you see that any holes are clogged, use a bent clipper to clean the blockage. Follow these tips and you will be able to effectively clean your barbecue. That way it will be well prepared for the next outdoor party.